This will be a quick post. This salad is really loosely based on some paleo salad recipe that I found and Jack made a while back. We really liked it, but this time it’s edited to use up whatever we had in the house this time around. 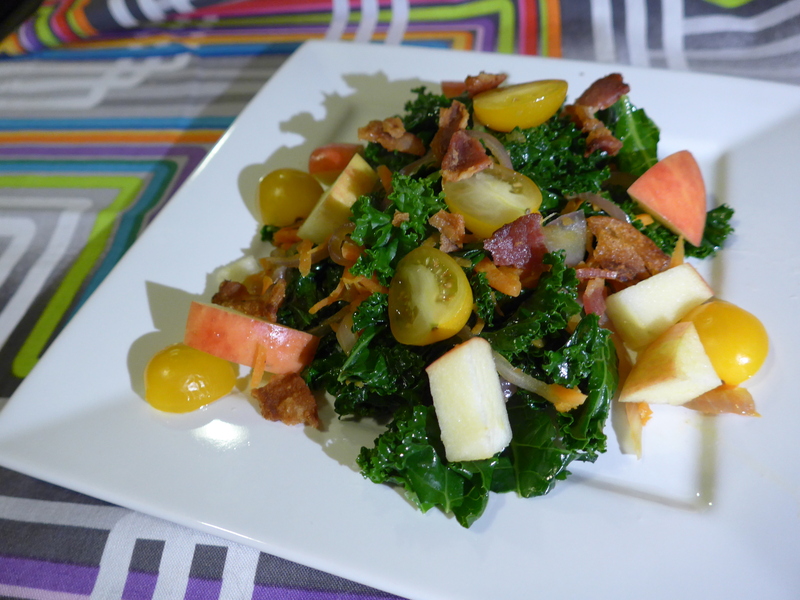 The basis for that salad was sauteing the kale in bacon fat and then crumbling that bacon over the top. This is an excellent side dish, assuming you like bacon and kale. I’ve brightened up this salad with apples, onions, and carrots, cooked along with the kale, and cherry tomatoes added at the end. I like the little yellow ones, as they are sweet, and they are hot house-grown, so they are still decent in January. If you don’t like some of these ingredients, leave them out! Well, not the kale or bacon. If you don’t like those, find a different recipe. If you can’t eat commercial bacon, consider making your own bacon. But the joy of salads is that they are malleable. Make them your own. Cook bacon in a skillet, I use cast iron, over medium heat, until crispy. Drain on paper towels. Drain off all but 2 Tablespoons of bacon fat. Don't clean the pan. Wash and tear the kale into bite-sized pieces. I like to use a salad spinner to dry it, but shaking it in a towel will work. Shred your carrots and slice your tomatoes in half. Then reheat the bacon fat over medium low. When hot, add the onion and carrot and cook until softened, 5-7 minutes. Add the kale and stir well, in handsful if needed to not overflow your pan. Chop and core the apples. I like the skin on for texture. Once the kale is wilted, add in the apples and stir well. Cook just until the apples are warmed. Add the tomatoes and crumbled the bacon on top. Serve warm.